Hi, I am interested in your 1971 Mercedes-Benz 250C (stock #CJNT052) listed on Autotrader for $19,900. I'd like to get more information about this vehicle and confirm its availability. 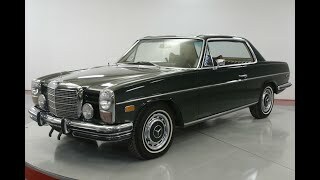 The Mercedes-Benz W114 and W115 models are a series of executive sedans and coupsintroduced in 1968 by Mercedes-Benz, manufactured through model year 1976, and distinguished in the marketplace by names relating to their engine size.